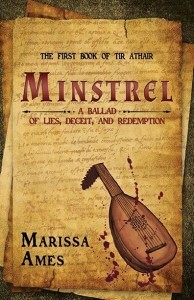 Book Excerpt from Minstrel by Marissa Ames! Arriving in the royal city of Cynegil just after the good king’s death, Liam and his traveling troupe face arrest for entertaining during a time of mourning. The new king, Riordan, offers them a choice: play for the court as he demands or be punished for the crime. With little recourse, they acquiesce. While the troupe entertains within the hall, Liam witnesses the dissension between the king and his twin brother, Shamus. When Shamus enlists Liam to record the kingdom’s history from his own viewpoint, the king becomes suspicious. And when Liam becomes involved with Molly, the mysterious redheaded washerwoman, and Tristan, the royal soldier with a deadly secret and a skill for causing unfortunate accidents, his life becomes even more complicated. As the kingdom staggers beneath drought, famine, and conflict, Liam and Shamus must flee Cynegil with prices on their heads. Will they survive their journey or will they become just another ballad to be sung? The soldier’s lips pursed. He looked unimpressed. “You’re summoned to court,” he said. Fergal’s jaw dropped and Kieran shuffled his feet. “Court?” Liam repeated. Last night’s bread sat hard in his stomach. Summoned, not arrested? Had he heard right? Liam had been to the bath house once. It was expensive. The additional services, such as shaves, haircuts, and companionship, cost more. “We just have enough money for a meal,” he said. “Another chance for what?” Liam argued. Casting Liam a sharp look, the soldier said,“Be there midday, to play tonight.” With a quick nod of his head, the soldier turned from them. The other three soldiers fell in behind him. The blond soldier turned with an impatient sigh. The soldier tilted his helmet back and looked up at the lilies. “You do realize this is illegal?” he asked, nodding at the cart. Liam sat back on the crate. He understood. The soldier never promised compensation. He only promised imprisonment if the players did not comply. Liam met Kieran’s grim eyes. They could dismantle the stage and leave Cynegil before the soldiers returned, or they could appear at court.